I’m using Pinterest to discover new recipes. I get drawn in by the beautiful photos but the recipe sources are not always known to me. This recipe falls into that category and was a bit disappointing. 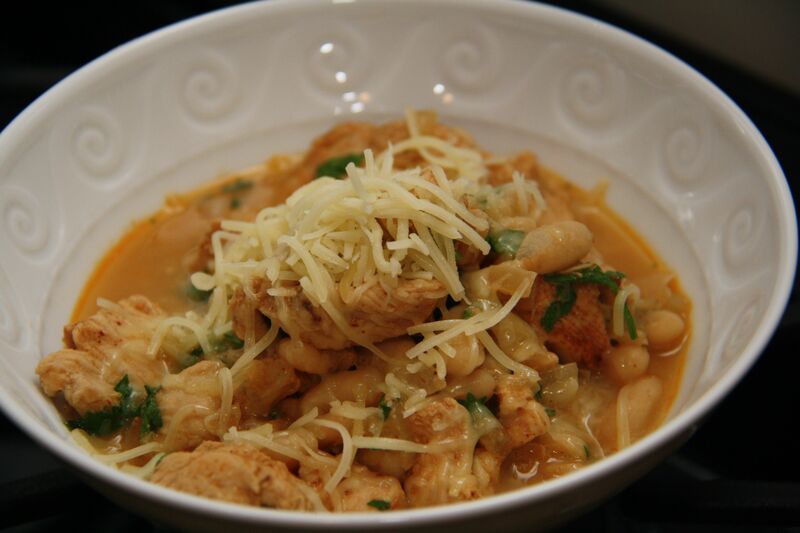 This white bean and chicken chili is not my favorite chicken chili. That honor belongs to the Barefoot Contessa. But the recipe is quick enough for a weeknight dinner and was good, especially if you don’t like your chili super spicy. Even though Tim and I both thought the chili was missing a little something, it was still worthy of a second bowl when we topped it with shredded cheddar, pickled jalapenos, and several dashes of green Tabasco (my fave!). 1. In a large Dutch oven, heat the oil over medium-low heat. Add the onions and cook, stirring occasionally, until beginning to soften, 4 to 5 minutes. 2. Push the onions to one side of the pan, add the chicken, and sprinkle with the chipotle chile powder, cumin, and salt to taste. Cook, stirring, until most of the chicken is opaque on the outside, 5 to 6 minutes. 3. Stir in 3 cups of the beans and 2 cups of the broth. Increase the heat to medium-high and bring to a simmer. Partially cover and cook until the chicken is cooked through, about 8 minutes. 4. Meanwhile, in a food processor, combine the remaining beans and remaining 1 cup broth. Process to a smooth puree. 5. Stir the bean puree and half-and-half into the soup. Divide the soup among 4 bowls and serve hot sprinkled with cheese and cilantro.